I just got my Chairigami standing desk (a benefit of supporting them on Kickstarter). 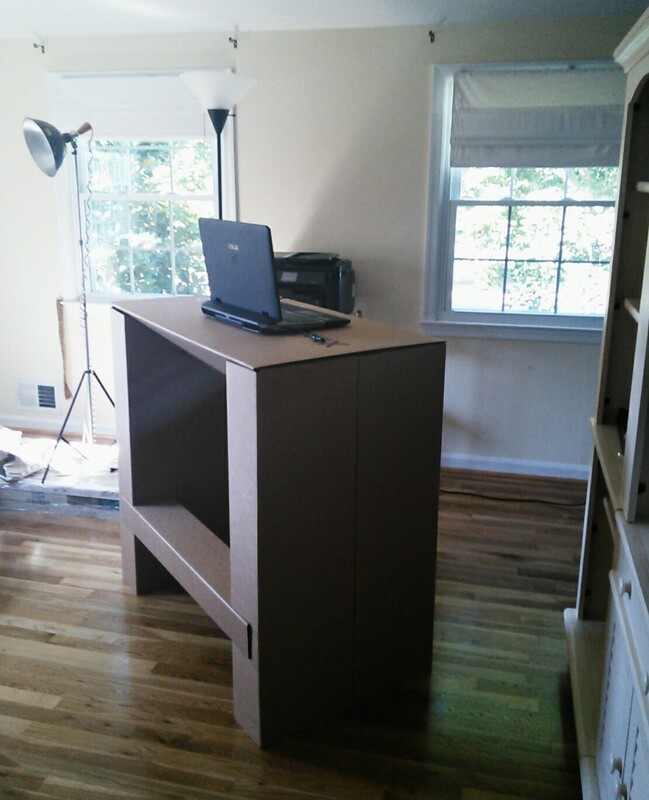 Unlike every other standing desk I’ve tried, I was able to assemble it by myself and in only about 10 minutes. There’s no nasty styrofoam packaging. Everything, including the desk, is recyclable. Things I like about it: It’s the right height. It’s sturdy and can support a lot of weight. When the cat leaps onto it, it doesn’t move. Eventually I will put my two large monitors, keyboard, and Wacom tablet on it, but right now I only have my laptop on it. It’s a gaming laptop that weighs almost 20 pounds though, so not a MacAir. I’m in the process of converting a spare bedroom into my office, and I can easily move the desk around to find where I like to work best and to make room for other furniture. I plan to paint and decoupage it, or let the kid do so. Things I dislike: There’s a crossbar support but it’s not a footrest – I’m one of those who needs to elevate one foot and then the other while I stand. Also, it’s cardboard and after a computer, the thing most likely to be on my desk is a drink. I’m planning to make parts of it moisture proof with duct tape sheets or something (where I put my drink and where I rest my arms – I live in a humid place), but that will make it look pretty ghetto, so that’s why I’m planning the all-over graffiti look. For the price (retails at $95) it’s a great standing desk option, especially if you aren’t sure you will use a stander. If you decide to get rid of it, that will be a lot easier than trying to craigslist a piece of furniture.